Having the right spices and ingredients in your kitchen will help you get started to try out the wonderful Indian recipes out there. Once you have some of the very basic spices and ingredients needed to make Indian recipes then you can expand your horizons and fill your kitchen with other exotic Indian ingredients and have fun experimenting with the wonderful Indian cuisine. Indian cuisine uses an extensive variety of herbs, spices and ingredients. Most recipes can be made with a basic group of ingredients. You will learn what you will need to get started and what are the most common ingredients to have when cooking Indian food. Onions : The regular yellow onion goes a long way in the Indian kitchen. You may also use the sweet Vidalia onions for making salads or the Red onions to cook with. Onions - sliced, diced chopped, pureed are used extensively in Indian cooking. To reduce tearing when peeling or slicing an onion, chill for 30 minutes or cut off the top, but leave the root on. The root has the largest amount of sulphuric compounds, which is what causes tears when the onion is peeled or cut. Ginger : Ginger can be bought fresh or in the form of Ready made pastes. Many regular grocery stores have a "Stir Fry Mix- Ginger and Garlic" which is a great substitute when a recipe calls for both ginger and garlic pastes. Garlic : Sometimes whole garlic cloves are used and sometimes a recipe will call for chopped or minced or for garlic paste. Most "Sam's" stores or warehouses do carry chopped garlic in plastic bottles. Some Indian grocery stores do carry ready to use garlic pastes - Nirav brand. Green Chilies : There are many green chilies available in the stores, starting from finger hot chilies, jalapeno peppers, Anaheim peppers and more. 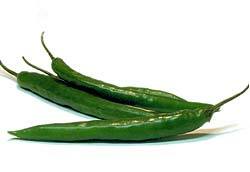 In Indian grocery stores you will find very small hot green chilies. These are very hot and therefore you must use caution when using them in a recipe. The ones that work well for Indian cooking are the Anaheim hot chilies. Fresh Cilantro leaves (commonly known as coriander leaves in India) These are an integral part of Indian cuisine and "THE" garnish used in Indian cooking. They are found in almost every grocery store and can be bought for $0.59 to $0.99 per bunch. If you get it from an oriental grocery, you will frequently find that it comes with roots. To store the fresh herb which is sold in bunches complete with roots, do not wash or cut off the roots. Simply put into a plastic bag, eliminate as much air as possible and close the bag with a twist tie. It will keep, in the refrigerator, for more than a week. Wash just before using. When 'fresh coriander' is an ingredient in a recipe, use the leaves and the stalks, chopped.